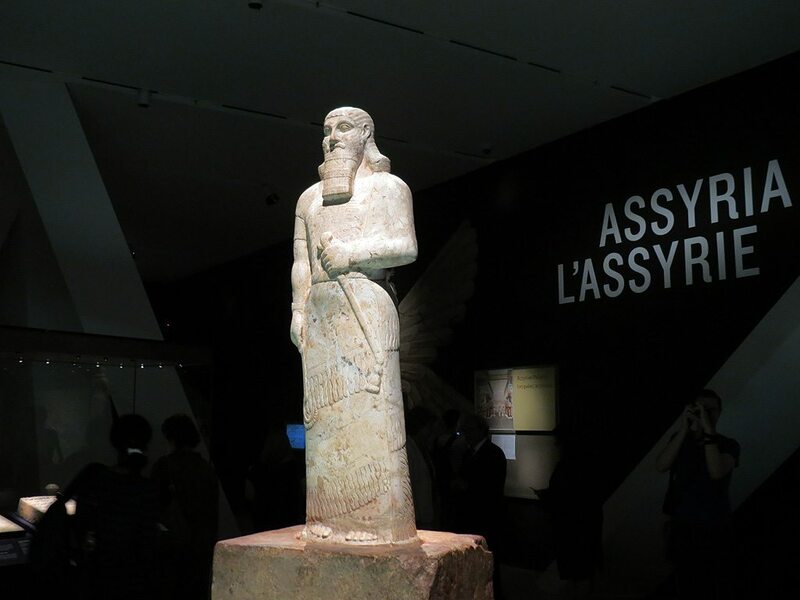 The ROM's new exhibit offers a glimpse into ancient Mesopotamia, the birthplace of urban civilization. Statue of Ashurnasirpal II. Magnesite (statue), red limestone (base). Nimrud, Temple of Ishtar Sharrat-niphi, 875 - 860 BCE. A representation of the Tigris River flowing through the exhibit. Striding Lion relief. Terracotta. Babylon, Southern Citadel, throne room facade of the palace of<br /> King Nebuchadnezzar II. Photo courtesy of the Royal Ontario Museum. Headdress with gold leaves. Gold, lapis lazuli and carnelian<br /> c. 2500 BCE. The Trustees of the British Museum. Image courtesy of the Royal Ontario Museum. Early administrative tablet. Clay. 3300 - 3000 BCE. Uruk. The Trustees of the British Museum. Photo courtesy of the Royal Ontario Museum. Display case showing symbols of kingship. Left to right, a modern replica of a bronze head of a king, an alabaster macehead (2254-2218 BCE), and a stone wig from Iraq (circa 2500 BCE). Animation running above Escape Across a River. Nimrud, North West Palace, 875-860 BCE. The name “Mesopotamia” derives from a Greek term meaning “land between the rivers.” The Royal Ontario Museum’s latest major exhibit, which opens on June 22, takes this literally, as visitors flow between painted representations of the Tigris and Euphrates rivers on the floor. Presented by the British Museum and rounded out with pieces from institutions in Chicago, Detroit, and Philadelphia, “Mesopotamia: Inventing Our World” covers 3,000 years of human development in the cradle of urban civilization. Most of the 170 artifacts on display have never been shown in Canada. “Mesopotamia was a true frontrunner,” notes ROM curator Dr. Clemens Reichel, “with great cities of sizes not achieved by Paris or London until the Industrial Revolution, empires that controlled most of the known world of that time, and technological achievements still shaping our lives.” Among those technologies: the tracking of time, which developed from an ancient base-60 numeral system. Connections to the present are inescapable throughout the exhibit. In one instance, visitors are greeted with two tablets, one clay (the height of written technology circa 2300 BCE), one electronic. While the artifacts are primarily organized by region (Sumer, Assyria, and Babylon), subdivisions compare ancient and modern notions of concepts ranging from globalization to justice. The uncluttered black backdrop and carefully considered lighting allow the artifacts to stand out. Creative interpretive aids include animated sequences in the style of some Nineveh Palace wall panels that are part of the exhibit. Coupled with normal information panels, these cartoons give viewers a better sense of the stories carved into the stone. We were amused by several photos showing some early-20th-century archaeological digs in Mesopotamia, where the workers appear to have been hired from central casting for a mummy flick. As the exhibit flows to the end of the Euphrates, it briefly touches upon modern problems with preserving Mesopotamian artifacts. A concurrent exhibit elsewhere in the ROM explores looting and other challenges preservationists have faced since the outbreak of the Iraq War in 2003. These issues will also be discussed during a two-day symposium in October. Other tie-ins include a series of seven lectures starting on June 27, with a talk by Reichel on Mesopotamian political leadership. Photos by Jamie Bradburn, unless otherwise noted.